If you have some significant powerboating experience that you would like to document such as boat ownership experience or cruising crew, the three-day course is for you. If you have been a guest/crew on a bareboat charter, or have some boating in your past, the five-day course is for you. The seven-day course is designed for those who are preparing for chartering in the Caribbean. This class allows for two days of solo time, to build confidence and experience in trip planning and spending the night at anchor. Other schools offer a similar lesson. Why should I choose San Diego Powerboating Academy? Our program is private. We do not try to put other students in your course. This is why we can offer 101/103/104 in one course. By concentrating on you, and your goals and dreams, we can be very successful. 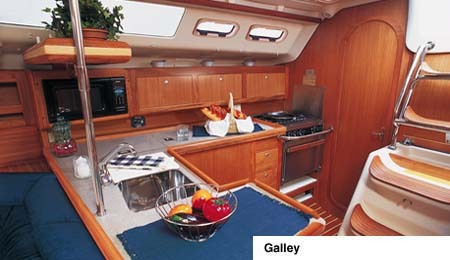 We specialize in this liveaboard program. Other companies try to arrange a part time instructor and one of their rental boats and you. This is very different than what we do. Our course is longer. Take our five day course for example, you may and should board your yacht on Sunday at around 2 pm. You and your partner can check in get acquainted with the boat and relax, read and get ready for boat handling on Monday. Our boats are awesome. We own all of our boats. We specifically purchased and outfitted these boats for this program. Make an appointment and see for yourself. Our location is awesome. 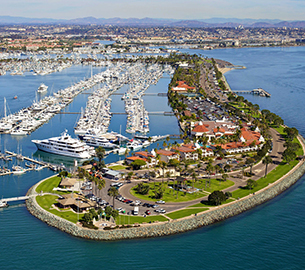 San Diego, California is open for boating year round. Some of the industry's best people live and work here. There is every type of boating related business. Have a question on watermakers? There are 3 businesses on Shelter Island that service and install watermakers. You will have the same instructor every day. At other schools you might have a different part time instructor every day. In short, we care. We want you to succeed in your boating goals. Nothing beats the feeling you get as a professional instructor when you get emails letters and pictures like these. No, we offer only private liveaboard instruction. Our student to instructor ratio is 2 to 1. It's not about how much you bring, it's about bringing the right gear. If you own gear you should bring it, if you don't, get it in San Diego where it is plentiful. If you own a GPS or a similar devise, you should bring it. The boating is cool, so a wind breaker and medium weight fleece is always a good idea. Hats and sunglasses are a must. It's warm in the summer 70-80's and cool in the winter 60-70's. If you have foul weather gear, you should bring it. If you don't and you need it, you can get a great deal here. Most of our students wish they had brought less clothes and more technical gear. One medium sized bag per person plus toiletries should do it. Yes, of course, classes are offered 12 months a year in San Diego. We are called "Americas Finest City". The best month depends on where you are from. May-November is when we get students from States where it is hot. (Arizona, New Mexico, Texas, Nevada, Utah etc.) November-May, we get students from Europe, the East Coast, Mid West and Alaska. We operate in a thermal sea breeze here. You'll see pretty much the same conditions year round. It's cooler in the winter, warmer in the summer. There really is no bad month. No, we get underway every day. We offer professional powerboating instruction aboard our Bayliner 3388 command bridge motor yachts. All our instructors are licensed yachtmasters, and certified powerboating instructors. Our tenured instructors have over twenty years of year round teaching experience with SDSA.com. Our newest instructor has worked here nine years. Please call 619-299-9247 or 800-441-8672 select an available week and provide us with a 50% deposit. We typically book about 45-60 days in advance. However, if you need a reservation sooner than that, please check with us for availability. If you have specific dates in mind, it is never too early to reserve exactly what you want. We do accept reservations up to a year in advance. No, your books, tests and certification are included in your tuition. The yacht will be supplied with a full tank of fuel. If I am a current member of a yacht club, do I have reciprocal privileges with SDPBA? Yes, we welcome current yacht club members and we will gladly extend reciprocal privileges. Typically, our students will either stay aboard one of our powerboats or make an independent reservation at the Kona Kai Resort & Spa. If you choose to stay at the Kona Kai, you will be afforded a special discount as a client of the San Diego Powerboating Academy. 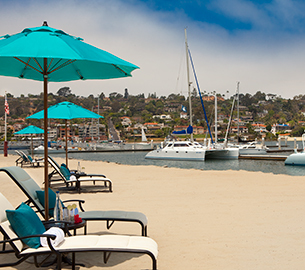 Whichever accommodations you chose, as a client of San Diego Powerboating Academy, all of the Kona Kai Resort amenities are available to you! If you will be staying aboard, our powerboats are fully equipped for you to live aboard including fresh linens, towels, and pillows. The galleys are fully equipped for cooking including BBQ's. There is hot water on board each yacht. 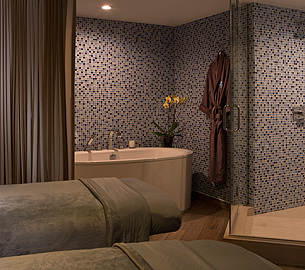 The Marina and Yacht Clubs have shower rooms, and laundry rooms. Are there restaurants or nightclubs in walking distance of the marina? 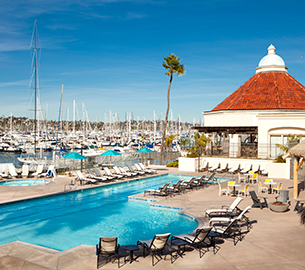 Downtown San Diego Marriott - Near the bustling Gaslamp Quarter. Easy walk to food and entertainment. No, you do not need your passport to take 101/103/104/105. However, if your yacht goes to Los Coronado's Islands in Mexico or crosses the US/Mexico border you will need to report to the customs dock and clear customs. It is recommended that you bring your passport. If you are taking Advanced Coastal Cruising 106 or higher your passport is required. I have already taken 101 but I haven't done much boating since. I want to have a refresher course, which course should I sign up for? The age for minimum certification is 16. If your child meets this criteria you and your child may complete the course together.